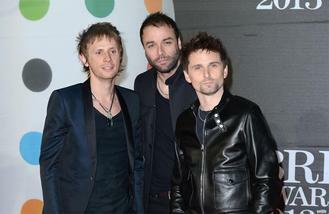 The Muse will drop a new song "soon." The rock band - comprised of Matt Bellamy, Chris Wolstenholme and Dominic Howard - have been teasing new music for months now but it looks like the end is finally in sight as they have shared some footage of them recording in the studio. Matt uploaded a video on his Instagram account of him with a guitar swung around his neck offering up feedback to producers after listening back to the track. He accompanied it with the caption: "Back in the studio. New song coming soon..."
As well as a new song on the way, the trio are set for a busy summer as they've been confirmed to top the bill at this year's Reading & Leeds, which take place between August 25 and August 27, for the first time since their gig at the festivals in 2011. The 'Uprising' hitmakers have teased that they will share more about their "plans", which could mean they expand on their rumoured idea to levitate off magnetics on stage, closer to the time but are currently remaining tight-lipped on their show. Organiser Melvin Benn said last year when the announcement was made: "I'm thrilled to be able to announce Muse as the first headliner for Reading and Leeds 2017. Their incredible live show promises to be an unforgettable performance - we have so much more to announce and I can't wait to reveal the rest of the line up." The band will join 'Cold Water' hitmakers Major Lazer - comprised of Diplo, Walshy Fire and Jillionaire - and metal champions Architects at the festivals.